When Wildlife is the Cause of Your Accident, Who Pays? Although Florida is one of the more populated states in America (boasting a population of approximately 20.27 million people in 2015), this does not mean parts of Florida are not “wild.” Depending on the road you travel and the hour at which you are on the road, it is not uncommon to find deer, gators, or other wildlife wandering on the roads as well. 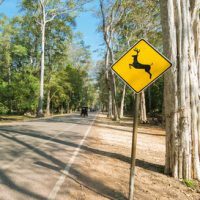 Unsuspecting drivers can suddenly collide with these animals and reptiles, resulting in injuries that can be just as deadly as those caused by collisions with other motor vehicles. The good news for drivers who collide with wildlife is that, in nearly every case, your personal auto insurance and/or health insurance will cover the medical expenses and certain other losses a victim suffers in a crash with wildlife. At the bare minimum, this will ensure that the injury victim receives appropriate medical treatment for his or her injuries and is compensated for the damage to his or her car. Can Someone Be Responsible for Wildlife on the Roadway? At first blush, it may appear impossible to hold another person civilly responsible for causing a crash due to wildlife being present on a roadway. After all, it is difficult to control even domesticated animals: how then can someone be expected to control the movement and location of wild animals? If the wild animal belonged to a person or entity that was keeping the animal on their premises (a zoo or exotic animal collector, for instance) and the animal wandered out of its enclosure and onto the road, however, then the owner may be responsible for the damage or harm the animal causes. This is especially true where the animal has broken out of its enclosure in the past and the owner failed to take remedial measures to prevent an escape in the future. Have You Been Seriously Hurt in a Florida Car Wreck? Contact Roman & Roman Right Away! No matter whether another car, truck, deer, or gator caused your car wreck, it is important that you inform yourself of your legal rights and how they can be best protected. Contact the seasoned Clearwater car wreck recovery attorneys from Roman & Roman right away to discuss the facts of your case and what rights you may be able to exercise. We will fight to help you recover the compensation you need for your injuries and losses. Call 877-767-1032 to learn more about your rights and how we can assist you in asserting them through a Florida car wreck lawsuit, or contact us through our website today.